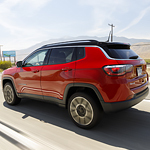 Meet the Elegant New Jeep Compass | Eagle River Chrysler Ltd. The headlights light up automatically when the sun sets or when dark skies threaten impending storms. A strip of LED bulbs creates striking daytime running lights that heighten visibility. Optional fog lights illuminate corners when making sharp turns. The new Jeep Compass is as appropriate to drive on city streets as it is on rural back roads. Take a ride in the capable SUV at your nearest Eagle River Chrysler Ltd.